Getting Ready for Those Peppers! Peppers are the most dependable and productive plants in my garden. I use peppers fresh, dried, ground, pickled, stuffed, fermented and fried. I have jars of pepper jelly, bottles of pepper vinegar and tins of ground chili. So this year I am growing even more peppers. And after several years of successful pepper growing, I have some favorites. Jalapeño plants seldom have pest problems and produce peppers early and often. Pickled jalapeños were one of my household's favorite preserves until we discovered how easy it is to make fermented hot sauce. Vibrant red or green jalapeños, salt, garlic, a little time in the kitchen and a couple of weeks fermenting in the jar produced incredibly complex, delicious hot sauces that became instant favorites with family and friends. I'm planning for at least 20 jalapeño plants this year. With such abundance, we can pick some unripe peppers for green sauce and still have plenty to ripen to red for the garlicky hot sauce we had to dole out too sparingly this year. And we are adding Tabasco peppers to the mix. My favorite sweet pepper last year was ‘Yellow Marconi. 'They are delicious picked green, but ripe yellow ones are worth the wait. These slim tapered peppers reach eight to ten inches in length. They are sweet and crisp when raw, but you can also roast and peel them, dressing them simply with good olive oil and salt. Serve them as an antipasto, or cut in strips and sauté with onions and sausage for a classic Italian main course. Marconis are beautiful in the garden and on the plate, and I have allocated a lot of space for them this year. ‘Quadratod' Asti Rosso' (red) and ‘Quadratod' Asti Giallo' (yellow) are classic sweet bell peppers ideal for salads and cooking. Both stand up to stuffing and baking. At the end of the season, I roast, peel and freeze these peppers for our Thanksgiving antipasto.Marinate them in olive oil with a little fresh garlic, salt and a splash of vinegar. This year we are trying ‘Jimmy Nardello,' an heirloom from Seed Savers Exchange. The company got the seeds from Nardello himself, who claims that his mother brought them with her when she emigrated from Italy's Basilicata region in 1887. I have also reserved smaller spaces for Thai peppers, habanero, arbol and other super-hot types. One or two plants of each will satisfy us. Our ‘Padrón' plants did not have full sun last year and had to stretch for light. The plants topped four feet and were a little rangy but consistently loaded with peppers. This year we will grow ‘Shishito' peppers, too. They are easy to grow and should be picked small and green for eating whole. Quickly roast, fry or grill them with a smattering of salt and olive oil.If you see them on a menu, you can order something else as you will have more in your garden the next day. With so many pepper options, how to choose? If you're not a cook, you might still enjoy growing multi-colored ornamentals for craft projects or holiday decorations. Or perhaps you need an heirloom pepper for an heirloom family recipe. What you can't eat fresh, you can dry, ferment or freeze for future use. 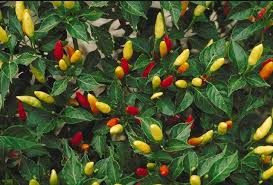 And a favorite pepper plant can be dug up and potted at the end of season to grow indoors through the winter. Peppers are easy to grow from seed. One of the most extensive offerings comes from Redwood City Seed Company. Craig and Sue Dremann have been collecting pepper seeds since the 1970s and their website offers 24 pages of tips to insure your success. February is not too early to plant pepper seeds. Plant them as soon as you can. Usefresh seed- starting mix for best results. Moisten the mix and fill trays, flats or shallow pots. Space seeds 1 inch apart and cover with ¼ inch of soil. Keep moist but not wet. Provide bottom heat from a seedling mat or keep them in a warm spot in the kitchen with plenty of light. When seedlings have four true leaves, transplant to small pots with rich potting soil. Keep them warm and provide plenty of light. You may have to repot seedlings one more time before hardening them off outdoors. Wait untilnights and soil are warm before planting. Peppers do not like cold. Dog Poop Fungus - Happy New Year! The impetus for the University of California Master Gardener program was to train a “help desk” to assist farm advisors in handling home-garden questions. In Napa County's small Master Gardener office, we have two computers, a phone and a few hundred books on gardening subjects. All of the answers we provide are supported by University of California research. A few months ago, before the rainy season began, I was working at the Master Gardener help desk. A gentleman came into the office and handed me a sample of something that had been destroying his driveway and tennis court. Another Master Gardener who works at a local nursery had advised him to bring this sample to the help desk for information. It was not a pretty sight. The nursery staffer had identified it as "dog poop fungus," albeit in less printable language. I took some information from the client and began a search. He said the fungus was growing right up through his driveway. I began perusing the books in our library to see what I could learn. Finally, I went to the computer and typed in the name the nursery staffer had given the specimen. To my surprise, several links came up. In the meantime, other people had walked into the office and said, "Oh yes, that is growing in my lawn." My computer sources identified it as Pisolithustinctorius. Although it resembles a souvenir from a passing dog, this hard brown item is a true fungus. And as “tinctorius” suggests, it can be used to make a purple dye. Pisolithustinctorius is also called the dye maker's puffball and dog stinkhorn. After talking with the county weed advisor and the Master Gardener program coordinator, I learned that the fungus grows in connection with tree roots, especially oak and elm. The fungus itself lives underground with the live or decaying tree roots. It is considered a mycorrhizal fungus because the tree roots and the fungus exchange nutrients and water. Apparently the driveway and tennis court had been constructed in a former treesite. Tree roots were still in the soil. Mycorrhizae can survive in soil even if the tree roots have decayed. You can see the mycorrhizae if you are repotting a pine tree such as a bonsai. Always try to transplant some of the mycorrhizae to the new location. In pine soil, mycorrhizae appear as a white, web-like material. body. It carries the spores that, when dispersed, will produce fungi in new homes. The part below ground is much bigger. According to the Bay Area Mycological Society, ourwarm, dry fall days encourage the fruiting bodies of Pisolithustinctoriusto appear. 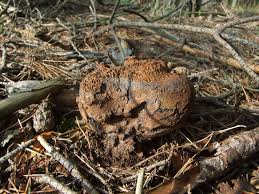 Many fungus and their fruiting bodies need damp conditions to grow and reproduce. They thrive on decaying materials such as leaf litter, downed limbs and compost piles. In these settings,mushrooms will mature and open to release their spores. The fruiting bodies of Pisolithustinctorius are poisonous and certainly not appetizing.A fungicide will eliminate the fruiting bodies but not the underground fungi; when conditions are right, they will fruit again. In the past, I had thought of mushrooms only as a delicious ingredient. But my reading revealed that the fungus family is a large one, neither plant nor animal. Scientists refer to the “fungi kingdom,” a reflection of how diverse it is. Some fungi are beneficial and used for medicines such as penicillin, but others are toxic, even deadly. You can even buy mycorrhizae to improve your soil, but those are not Pisolithustinctorius. You can view a photo gallery of fungi at www.kingdomoffungi.com. Now that the Master Gardener help desk has identified this homeowner's problem, we are waiting to hear from you with another challenge. Please bring any plant or insect samples in a sealed plastic bag. Workshop: U. C. Master Gardeners of Napa County will host a workshop on “Rose Pruning and Maintenance” on Saturday, January 9, from 10 a.m. to noon, at the University of California Cooperative Extension office, 1710 Soscol Avenue, Napa. This workshop will feature demonstrations of proper pruning techniques. Master Gardeners will discuss types of roses, common rose diseases and routine maintenance. On-line registration (credit card only); Mail-in registration (check only). Workshop: U. C. Master Gardeners of Napa County will host a workshop on “Fruit Tree Pruning and Care” on Saturday, January 16, from 9:30 a.m. to 2 p.m. The workshop includes a lecture session from 9:30 a.m. to 11:30 a.m. at the University of California Cooperative Extension office, 1710 Soscol Avenue, Napa. A hands-on session follows from 12:30 p.m. to 2 p.m. at Silverado Middle School, 1108 Coombsville Road, Napa. On-line registration (credit card only); Mail-in/Walk-in registration (cash or check only). 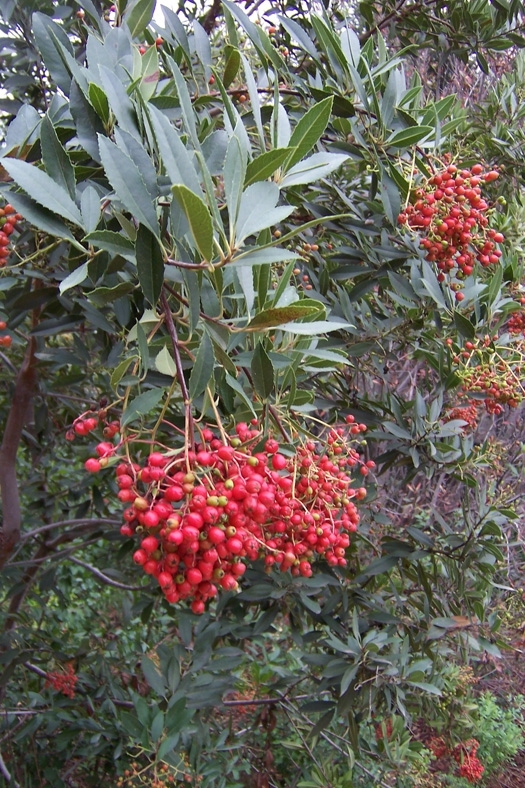 Toyon occurs extensively in the chaparral and woodlands surrounding the Central Valley and in other foothill regions of the state below 4,000 feet. In fact, its resemblance to European holly and its abundance in Southern California explain the origins of the name Hollywood. Toyon got its name from the Ohlone tribe. It is also called Christmas berry or California holly. A member of the rose family, toyon typically grows 8 to 15 feet in height and width. However, some specimens grow larger and work in the landscape as small trees. The plant has dark green, leathery, oblong leaves that are two to four inches long. In spring, the shrub is covered in flat-topped clusters of fragrant white flowers that attract bees and butterflies. As the season progresses, the flowers give way to dense clusters of small, orange-red berries that last late into the year. These berries attract many local birds: American robins, quail, towhees, cedar waxwings, mockingbirds and various finches and sparrows. So in addition to its beauty, toyon is an excellent habitat plant. The berries also make the plant useful for home décor at Christmas, if you can get to the berries before the birds do. Like many of its cousins in the rose family, toyon is susceptible to fireblight. The cultivar ‘Davis Gold,' developed at the University of California at Davis, has striking yellow berries and improved disease resistance. Toyon tends to be ignored by deer, although desperate deer may eat the new leaves of smaller plants. This hearty California native tolerates serpentine, adobe and sandy soils. Unlike some other members of the rose family, toyon requires little pruning to make a great screen or help with erosion control. For best results, don't try to contain it in a pot. Plant it in full soon and give it room to grow. Although it can take some light shade, it will be fuller and more compact in direct sun. Water deeply and infrequently the first few years to encourage deep tap roots, then sit back and enjoy all its berry beauty-ness. If you like to bird watch, be sure to plant it where you can watch the birds gorge on the winter berries. So if Hollywood was named after the Christmas berry, could it be that the “vine” of the famous intersection Hollywood & Vine was named after another California native,Vitiscalifornica(California grape)?Heteromeles&Vitis.Toyon& Grape. Neither pair rolls off the tongue quite as nicely as Hollywood & Vine. Workshop: U. C. Master Gardeners of Napa County will host a workshop on “Fruit Tree Pruning and Care” on Saturday, January 16, from 9:30 a.m. to 2 p.m. The workshop includes a lecture session from 9:30 a.m. to 11:30 a.m. at the University of California Cooperative Extension office, 1710 Soscol Avenue, Napa. With hands-on session at a local orchard, rain or shine,from 12:30 p.m. to 2 p.m. Please dress for outside weather conditions.On-line registration (credit card only); Mail-in/Walk-in registration (cash or check only). My garden never smells better than when my citrus trees are blooming. That sweet, clean, slightly astringent smell evoke thoughts of freshness and the wonderful fruit to come. During the winter of 2014, which was extremely dry and cold, I lost my sweet little young Meyer lemon. I was flummoxed as to the reason. Yes, I had listened to the frost predictions and conscientiously covered the tree during the nights the low temperatures were predicted. Yes, I had augmented this arrangement with outdoor-certified extension cords and flood lights to create heat. When the sun came up in the morning, I removed the coverings and turned off the lights to allow the tree and the soil beneath it to absorb as much daylight and ambient daytime heat as they could. What had I done wrong? My poor tree was so stressed from lack of water that it didn't stand a chance. I had stopped irrigating in November and never gave it a second thought. But think back to that winter. We had very light precipitation and frequent frosts. Being a baby, the tree had no reserves.Faced with the lack of water and the cold, it could not cope. I have since decided that the tree's location was not the optimum choice. Napa Valley is blessed with a mediterranean climate, characterized by mild, wet winters; mostly prevailing westerly winds; and warm, dry summers. Coupled with the many micro-climates in our gardens, this weather allows us some options for placing citrus trees. Microclimates are the distinctive climates zones within your garden. At the end of a hot day, walk around your garden after the sun has gone down. I did this recently when I took the dog out late at night. As I walked by the west-facing side of our stucco house at midnight, the day's heat was still radiating off of it. Any frost-sensitive citrus tree would love living there. So choose a west- or south-facing location, preferably against a wall or fence that will capture and return the daytime heat. Frost protection is a major issue with citrus. Stay informed about the weather and be prepared. Keep tender plants hydrated, and keep the area beneath your citrus trees' canopies free of mulch or any cover. This will allow the soil to absorb heat during the day, and after the sun goes down, the rising heat will warm the trees. Cover your citrus when frost threatens to protect delicate foliage. The entire neighborhood gets to see my taste in linens because I use old sheets, but a cloth tarp works, too. Plastic isn't recommended as it does not breathe. Try to keep the cover off of the foliage by draping it over some kind of structure. If the cover touches foliage, those leaves may freeze. Uncover when the sun comes up. Christmas tree lights (the old-fashioned type, not LED) can add a few degrees of protection. Drape them around the trunk and branches, or place a large spotlight on the ground under the cover. Use only outdoor-rated lighting and cords. Citrus have shallow roots that are easily damaged, so plant them where the soil does not get disturbed. Monitor soil moisture even in winter. Don't allow container-grown trees to dry out completely. Consider growing citrus in containers to have more location options. You can put wheels on the pot and position the tree in your best location to take advantage of microclimates. Container-grown citrus needs to be transplanted every three to four years and monitored closely for nutrient deficiencies. Choose the citrus varieties best suited to your area. Check for pests frequently. Feed regularly to keep the foliage green and the fruit coming, especially with young trees. Workshop: U. C. Master Gardeners of Napa County will host a workshop on citrus on Saturday, October 24, from 9:30 a.m. to 11:30 a.m., at the University of California Cooperative Extension Office (address below). 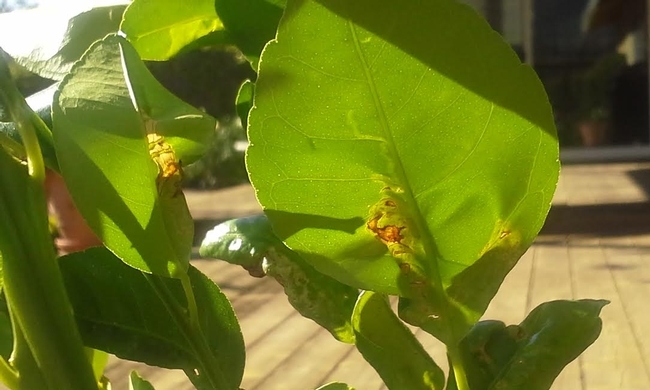 This workshop will focus exclusively on caring for citrus, large and small. Potting and repotting container citrus, pruning, watering and fertilizing, frost protection and recovery from frost damage are part of the program. The workshop will also cover using the University of California IPM website to identify and understand citrus diseases and pests. Online registration (credit card only); Mail-in registration (cash or check only). Workshop: U. C. Master Gardeners of Napa County will host a workshop on El Niño on Saturday, October 31, from 9:30 a.m. to 11:30 a.m., at the University of California Cooperative Extension Office (address below). An El Niño winter is on the horizon, no doubt about it. Napa County could well see heavier than average rainfall. This workshop will focus on measures to take now to prepare your home and garden for heavy rain. You will also learn steps to take during and after a flood.Online registration (credit card only)Mail-in registration (cash or check only). Have you thought about planting an asparagus bed? Asparagus crowns are available in local nurseries now. If you are patient and forgo harvesting tasty green spears the first two years after planting, a properly sited asparagus bed can pay off in bountiful spring harvests of asparagus for the next 12 to 15 years. Some well-tended asparagus beds still produce after 25 years. Asparagus is a hardy perennial that adapts to a variety of temperatures. But it is happiest in a climate like ours, where winters are cool and the ground might freeze just an inch or two. When you are looking around for the best place to plant asparagus, keep a few things in mind. The vegetable wants plenty of sun and good drainage. And because asparagus beds last a long time, put them where they will not be bothered. Even if home-grown asparagus won't grace your table the first two seasons, the plants provide beauty and interest in your garden. Asparagus makes a beautiful screen with soft, ferny foliage and red berries. But it is tall and can shade other plants, so plan accordingly. If you prepare your asparagus bed correctly, you will not be digging it again for a long time. Break up the soil 18 to 24 inches deep. Add organic matter to feed the plants and provide good drainage. Aged manure, bone meal, blood meal, wood ashes, compost, worm castings and leaf mold are all good choices. Dig in these amendments before heading off to the nursery. Asparagus crowns do best when you get them into the ground and watered soon after purchase. You can start asparagus from seed—more economical than buying crowns—but you will need to wait an additional year before harvest. That's why most gardeners plant one-year-old crowns. At the nursery, choose plump, grayish-brown crowns that look healthy. Remove any rotten or dried roots. Plant crowns 12 inches apart; measure and mark the planting spots before you head to the nursery. To plant, dig a trench 18 to 24 inches wide and set that amended soil aside. Return 2 to 3 inches of the amended soil to the trench spreading it along the bottom of the bed. Gently spread the roots of each asparagus crown over the mound so the crowns are slightly above the roots. Cover the crowns with 2 to 3 inches of amended soil and firm it well. As the asparagus begins to grow, add more amended soil to the trench to cover the exposed crowns until the trench is filled. Water as needed if nature doesn't. 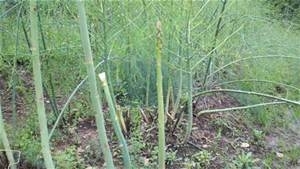 To maintain your asparagus bed, weed thoroughly in the spring. Pull weeds gently instead of hoeing to avoid damaging the fragile new growth underground. Do not harvest the first year after planting. The second year, harvest only lightly. Newly planted asparagus grows long storage roots. These pencil-thin, fleshy roots store the carbohydrate synthesized from sunlight that the ferny foliage captures all summer long. The following spring, this energy pushes up through the earth in exuberant growth. It is an amazing thing to see fresh asparagus spears push toward the light, sometimes growing a foot a day. When it is time to harvest, snap off 6- to 8-inch spears at or below the soil surface. The plants can get away from me, and I am not averse to using spears that are up to 18 inches tall. But the stalks still have to snap off to make it to my kitchen; if they don't, they aren't fresh. Harvest daily in season and use immediately, or refrigerate in a plastic bag for a few days. Asparagus freezes well and can be steamed, baked, braised, grilled and used in cold and hot soups. Pickled asparagus is wonderful for appetizers or Bloody Marys. After the harvest, let the ferny foliage grow. Female plants set attractive red berries. When the ferns start to yellow and die, or if there is an early freeze, cut the foliage back to 2-inch stubs. Some people have a reaction to eating asparagus; it's harmless but hard to ignore. We will not talk about that, however. You know who you are. This is a free workshop but pre-registration is requested. A minimum of 10 attendees is required or the workshop will be canceled.